You place on your helmet. You create your character. And you are warped into a large fantasy world of Heviin. You quickly learn that Heviin is separated into four parts. The Mainland Heviin, the large, dangerous desert known as Equos, and a small, true paradise some dubbed as "The Second Chance Paradise" known as Zoi Genesi. A rather large barren wasteland. Here, death is your fate. Spend too much time in this unforgiven land and your body starts to deteriorate. Slowly your fingers and toes starts to disappear. Then your arms and legs. Then your body. It is a slow and painful death. The scary part about this death is that along with your body, your soul goes. In a normal death, your soul is still alive and you keep your consciousness as a spirit. But in Equian Cursed Death, your spirit dies. Your conscious dies. There is no after life. So why would anyone be crazy enough to trek through Equos? To reach Zoi Genesi. The land that promises what Heviin can not. A true freedom and a true second chance of life. This is the goal of every player. To reach Zoi Genesi. There is a manufacture defect with your helmets. You can not log out. The only way out is to reach your goal at Zoi Genesi. Character Description: A little shy, but she is friendly if approached. She is not incredibly brave, but can fend for herself if need be. She often gets a little spooked out at small things, like howling of wind or an extremely loud noise. 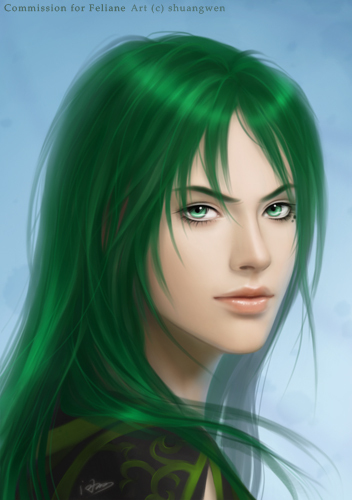 Her real name is not Aelhaearn; she just uses that as her avatar name because she loves fantasy. She also loves playing video games. That's exactly what I thought when I read it, a Sword Art Online type role-play. Looks like fun. May tidy up my application later on. Character Name: Esrael (ess-ray-el). Real name: Claire. Character Description: Being an elder child Esrael has a sense of responsibility with most actions she takes. This is thought to be the reason why she feels she needs some form of control over any situation, in order to be prepaired for what awaits. She too is very aware, liking to know what's going on around. Again tieing into the fact Esrael doesn't like to enter a situation without prior knowledge to better herself. When around other people she often tries to liften the mood up by being outgoing and friendly, although sometimes her need to suceed pushes people the wrong way and ends up doing the opposite effect intended. This in recent years has slowly died down, although still happens occasionally. She likes to see a happy aura around her, feeling depression and hopelessness dereates her own selfesteem and too makes her agrivated. Esrael likes to deal with her own problems and often isolates herself for a period of time during these times. This though isn't said for her fears, in which she tries to mask unsucessfully. Character Strength: Determined and headstrong while still being friendly. Leading or being in control of certain aspects. Keeping peoples spirits up, or at least giving it a good attempt. Character Weakness: Has an incredibly hard time accepting help and often alienates the people around her when she is in need. Hasn't the best eyesight when it comes to seeing things very far off. The horizon becomes a blurr of grey. Sword, Wand, or Healing Potion? : Sword. Character Description: Shy, but comes out when in battle or with good friends, friendly but fierce if angered. spooks easy with little things, brave when faced with a battle, able to do hard labor and it willing to take challenges. Character Strength: Great with a sword and Doesn't back down easy.